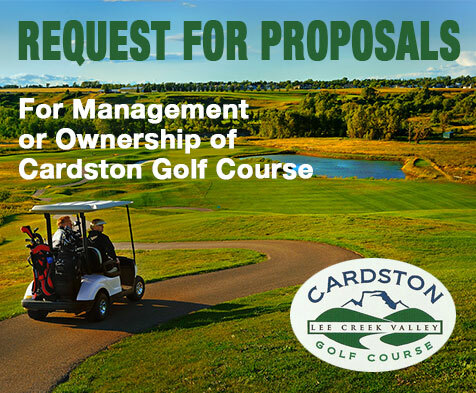 The Town of Cardston (Town) is looking for proposals from qualified firms or individuals (the Proponent) specific to the staffing, management or ownership of the golf course. The Town is interested in any type of proposal related to the golf course and is not looking to limit the scope of proposals in this initial stage of investigation via the request for proposal (RFP) process. This is a non-binding proposal process for the purpose of soliciting feedback from qualified stakeholders wishing to be involved in some capacity with the golf course. The preferred aim of the Town of Cardston is to enter into an agreement to operate, or have operated on the Town’s behalf, the local golf course in the most sustainable fashion for the Town coupled with a fiscally viable scenario for the Proponent. It is the intent of the Town of Cardston to conclude the RFP process as soon as is reasonable following the closing date and that the successful Proponent (if there is one) will be assuming operations in whatever form for the 2018 season. For many years, the Town operated the golf course with its own staff. Much of the oversight of operations was delegated to a golf committee made up of a combination of elected officials and citizens at large. In 2011, the Town entered into an arrangement with a corporate entity to manage all facets of the operation of the golf course. This group was given relative autonomy to operate the course as they saw fit and were responsible for all major aspects such as receivable and payables, human resources, maintenance, equipment procurement and disposal, and capital investment. This relationship continued until the end of 2017, wherein the relationship was mutually concluded. g) There is a modest amount of clubhouse inventory i.e. clubs, balls, shirts, hats etc. h) There is a modest supply of fertilizers and chemicals requisite for grounds maintenance totalling approximately $30,000. i) There are no other accounts payables or receivables attached to the operation of the golf course. j) Private entities operating the course arms length from the Town may be obligated to pay municipal, school, and home for the aged taxes. For reference, the 2017 tax implication for the property was $39,821 municipal portion, $11,969 school portion, and $795 home for the aged portion. The Town may waive the municipal portion where it is determined equitable to do so. k) In 2017 there were approximately 13,500 rounds played. Of the 13,500 rounds, 6500 were green fee play and the remainder were by members via their membership dues. l) There were 165 members in 2017.
m) Taking the average of the past few years, the course hosted 1 tournament annually with greater than 100 players, and 12 – 15 tournaments a year with 20 – 50 players each. n) The course is generally open from March 15 – October 15 seeing an average of approximately 150 open days per season. Proposals must be received no later than 2:00pm local time on January 5, 2018. The Town will not be responsible for any costs incurred in the preparation, delivery or presentation of proposals. The Proponent is to submit one (1) unbound original copy OR one fax copy to the number listed above OR one (1) pdf electronic copy emailed to the email address above. If faxed or emailed, the Proponent must phone the Town of Cardston office at 403-653-3366 to confirm receipt of the proposal. The Town will not be responsible for proposals that did not reach the destination as a result of communication or electronic malfunction. The deadline of January 5, 2018 at 2:00 pm is in force for all means of submission electronic or otherwise. a) Title Page – Referencing the RFP title, the Proponents name and address, and if the Proponent is a company, the name, telephone, and email contact information for the contact person. Also included shall be the date of the proposal submission. b) Assumptions – An assumptions section that lists all of the assumptions that the Proponent has about information or arrangements to be provided by the Town. c) Project Team – The proposal will include a list of personnel to be assigned to the project, their relevant experience, qualifications and involvement on the project. The Project Manager should be clearly identified. The proposal will also include a list of any sub consultants / contractors including their role, experience and personnel to be utilized (where known). d) Methodology – The proposal will describe the overall approach to achieve a successful objective and benefit to the Town and Golf Course. e) Compensation Schedule – The proposal will detail the required offer, compensations or any other considerations whether monetary or otherwise that the Proponent feels will be necessary to make the proposal viable and sustainable. Please note that the Town recognizes that the Proponent is making the proposal based on a number of assumptions and that the compensation expectations of both parties may be altered as more due diligence is completed by both parties. Proposals shall be properly executed with signatures in handwriting of the persons executing the proposal. If the Proponent is a corporation, the proposal should be executed under the corporate seal. In order to better provide context into the physical assets involved in the facility, the Town will entertain taking serious Proponents through the building, inventory and equipment prior to the close of the RFP process. Requests for an on-site visit may be coordinated through Jeff Shaw at the contact information above. Proponents are notified that the lowest cost proposal or any proposal need not be accepted by the Town, and the Town reserves the right to reject any and all proposals at any time with out further explanation, or to accept any proposal considered advantageous to the Town. Proposals will be evaluated by the Town Council or a Committee on behalf of the Council. Criteria such as project understanding, project team, compensation, experience and overall satisfaction of the Council of the Proponent to utilize, protect and enhance the asset of the Town. The Town may, prior to and after the contract award, negotiate changes to the scope of work, or any conditions with one or more of the Proponents without having any duty or obligation to advise any other Proponent or to allow them to vary their proposal. The Town shall have no liability to any other Proponent as a result of such negotiations or modifications. Award of any proposal will be in the form of written notice of award, duly authorized from the Town of Cardston. No other communication from the Town or representation from the Town shall constitute an award. All documents submitted to the Town are subject to the protection and disclosure provisions of the Freedom of Information and Protection of Privacy Act. While the Act allows persons a right of access to records in the Town’s custody or control it also prohibits the Town from disclosing your personal or business information where disclosure would be harmful to your business interests or would be an unreasonable invasion of your personal privacy as defined in Sections 15 & 16 of the Act. Applicants are encouraged to identify what portions of their submissions are confidential and what harm could reasonably be expected from its disclosure.